Available in appreciation of a suggested donation of $65 or more. Throughout 958 pages, citing the most ancient sources, Brent traces our common law (now confined to a half dozen countries) from its roots in the laws of Nature and of Nature's God and also the civil law (now covering our globe) from it roots in Babylon, through Egypt, back to Babylon, then to Pergamos, Jerusalem, Rome, and on into the entire world. Excellence of the Common Law indexes over 1000 Bible references. "Excellence of the Common Law, says nothing new of our common law but much that is old—some that is forgotten and some that has been lost. And if our common law is lost, enjoyment of our freedoms will be lost also." 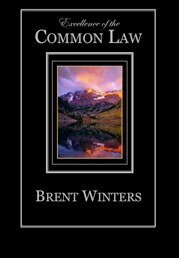 Citing the most ancient sources, Brent Winters traces our country’s common law (now confined to a half dozen countries) from its roots in the laws of Nature and of Nature’s God and the civil law (now covering our globe) from its roots in Babylon, through Egypt, back to Babylon, then to Pergamos, Jerusalem, Rome, and Revolutionary France and thence on into the entire world. An absolutely invaluable, eminently readable, and essential reference regarding the Constitutional law of the United States of America. Over 1000 Bible references indexed. Contents Include: Introduction (35 pages); Civil Law: Origin & Growth (121 pages); Common Law: Origin & Growth (251 pages); Common Law & Scripture (129 pages); Common-Law & Civil Law Contrasted (169 pages); Conclusion (29 pages); Appendices (139 pages); Bibliography (13 pages); Hebrew, Aramaic & Greek Word & Phrase Index (9 pages); Scripture Index (11 pages); Word Index (37 pages). I have been reading your book with interest and enjoyment. As a law professor it is giving me knowledge and insights that I have not obtained elsewhere. Thank you for your work. I keep Excellence of the Common Law on my bed stand for easy reference. And am again encouraged to know that I am not alone in my preoccupation with the first principles of the common law. If every Christian reads this book and teaches it to their children, we will make good strides back to liberty. As it is now, Evangelical Christians are anointing Nimrod as protector and turning their backs on God. Read the book and you will understand the parallels between now and when the Babylonian settlers chose to be dominated by Nimrod for security. This book is the best book I have ever bought (actually received as a gift). It is a completely facinating account of historical events as related to religion, scripture, law, man, humankind and the push of the Roman Justinian and their code of civil law in order to do away with the God's law, the law of Nature, and maintain the status quo. This book has not left me disappointed even for a second and has kept my attention thru the 310 pages out of almost 1000 pages that I have read so far. Excellence of the Common Law with the Study Guide are available in appreciation of a suggested donation of $90 or more by money order.